This fabulous Forest Creek home shows like a model! This barely lived in, well-maintained home is move in ready. You will be impressed with the gorgeous textured laminate floors in the bedrooms/closets, living room, dining room and hallway. The home also has tile in both bathrooms, laundry room and kitchen. The beautiful kitchen boasts Corian countertops with a high bar for entertaining. Enjoy the open concept floor plan with natural lighting and ceiling fans in the living areas. The over-sized, partially covered screened in lanai is great for relaxing in the outdoors. Another wonderful feature is having no neighbors in the back! Come see the gated community of Forest Creek, and feel the tranquility of this beautifully manicured Neal Community close to Fort Hamer Bridge and approx. 30 minutes to the beaches. You will love all the wonderful community amenities such as the dog park, nature trails, resort-style pool, hot tub, basketball court, playground, 24hr fitness center and fantastic clubhouse. You can also enjoy canoeing and kayaking on an 18 acre lake with 2 gazebos. 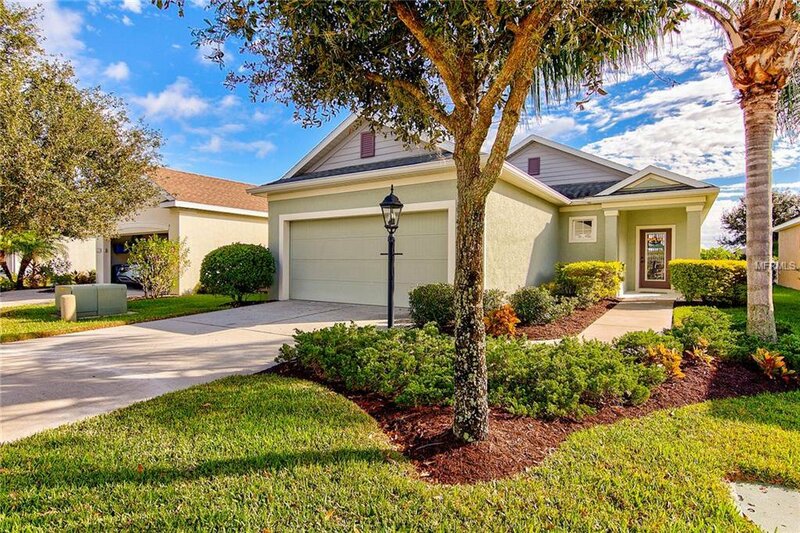 Being only a few miles from the interstate, Forest Creek is conveniently located between St. Pete and Bradenton. CDD fees are included in the taxes & HOA fees are very LOW. Click on virtual tour link for a 3-D walk through experience. Listing courtesy of KELLER WILLIAMS REALTY SELECT. Selling Office: KELLER WILLIAMS REALTY SELECT.